We seem to be saying the same thing over and over again with regard to recent signings to Bellator MMA, but Chael Sonnen’s marketability makes him the biggest coup of Scott Coker’s reign with the promotion. Sonnen’s ability to talk fights into the mainstream consciousness was most prevalent during his two championship fights with Anderson Silva. The Brazilian was one of the most dominant champions of all time ahead of his meeting with ‘The American Gangster’ and despite coming into the bout from relative obscurity, Sonnen was the toast of MMA after their meetings due to the interest he provoked. Despite losing on both occasions against ‘The Spider’, Sonnen boasted massive bouts throughout his main career on the back of the fights. Silva too was bolstered significantly by his American counterpart, and in hindsight, the Sonnen fights cemented his legacy unlike any other bouts he contested under the UFC banner. Since his signing, Sonnen has talked at length about fighting some of the UFC legends of old that have been signed to Bellator, but with Michael ‘Venom’ Page still looking for a top-tier test to validate him as an elite mixed martial artist, Sonnen is the perfect litmus test for the Brit. Despite being one of the most spectacular strikers in the sport at the moment, many feel that Page’s tests leave a lot to be desired. Evangelista Santos is thought to be the most challenging opponent ‘MVP’ has faced, but many felt the fact that he was knocked out two months before he met Page wouldn’t do him any favors. The two-round exhibition Page put on in London confirmed their beliefs. On top of his ability to sell, Sonnen’s wrestling made him one of the worst opponents’s to face in the middleweight division, especially for strikers. The build up to their fight would give Page a huge platform for North American audiences with Sonnen’s microphone machismo drawing the casual MMA fans in. Win, lose or draw, Page’s profile would be significantly increased from facing off with the Oregon native. Given that Page’s last opponent, Santos, was able to take him down before suffering a fractured skull at the end of a brutal flying knee would give Sonnen confidence too. However, it seems quite likely that Sonnen will join his fellow veterans for one of Bellator’s well-known legends bouts instead. A former middleweight contender, at 39-years-old, Sonnen could still probably give the majority of Bellator’s 185 lbs division some trouble. 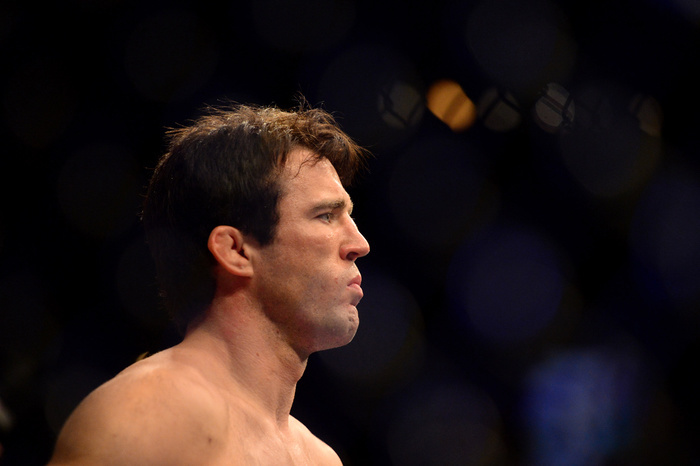 Yet, with only so many miles left on the clock, Sonnen is positioning himself for bouts with other former champions who are seeing out their twilight years with the promotion. Appearing on yesterday’s episode of ‘The MMA Hour’ Sonnen declared interest in a few big names from yesteryear. “I think it’s going to November 19 in San Jose with Tito,” Sonnen told Ariel Helwani when discussing a potential debut with the promotion. “I like that as a first fight. I like it a lot. “There are only a handful of the guys that I’m likely to end up being matched with right out of the gate, but then things will change. There is no doubt that Sonnen will command our attention regardless of who he fights, but it seems strange that the promotion wouldn’t use him to cut the teeth of some of their emerging pros, especially with a potential superstar like Page. Every opponent brings a unique set of risks and rewards to the forefront for their opponents. With all the talk directed towards Sonnen versus Ortiz at the moment, you can’t help but recall the mess that was the announcement for the sophomore outing of ‘The Huntington Beach Bad Boy’ with the promotion. We all get that mixed martial arts has its roots in pro wrestling, but Stefan Bonnar bringing a masked “former training partner” of Ortiz’s into the cage for their fight announcement broke a lot of hearts within the die hard MMA fan community. The stunt was rightfully lambasted by the MMA Universe and with Sonnen’s pro-wrestling rhetoric, the promotion could take a meeting between Sonnen and Ortiz in a similar direction. Page has something that Ortiz, Jackson, Fedor and ‘The Axe Murderer’ don’t have at the moment, relevancy in the modern game. A win over the sport-karate crossover athlete would do more for Sonnen’s career than any opponent he has mentioned, apart from MacDonald.